The World Blitz Championship at the Tal Memorial in Moscow has just concluded, with Magnus Carlsen first, Viswanathan Anand second, and Sergey Karjakin third. Carlsen dominated the field today and the three have led since yesterday. See the final table at ChessBase for full results. The Tal Memorial Blitz event is for many the highlight of this wonderful tournament, which this year is among the strongest in history. Blitz has a visceral appeal that anyone can relate to with only a basic understanding of the game. Such events should receive wider publicity. Video is available online from the official site and was available live during the event. Numbering the days after the tournament's fortnight, you can see video of the blitz event on Day 16, Day 17, and Day 18. It is interesting to watch even when the board is not very visible (though I recommend playing over the games at the same time on Chessgames or with the PGN). ChessBase covered the action also in their reports: "World Blitz Championship Day One: Anand Leads," "Impressions from Day One in Moscow" (by Misha Savinov), "World Blitz Championship Day Two: Carlsen Takes Over," "Trials and Tribulations of a Blitz Player," "Carlsen Wins with Three-Point Margin," "World Blitz Championship: Pictorial Impressions," "World Blitz Championship: Close-Up Video Footage." U.S. resident Alexandra Kosteniuk finished at the bottom of the field, but she had some very strong scalps along the way, including wins over the top finishers Anand and Carlsen. 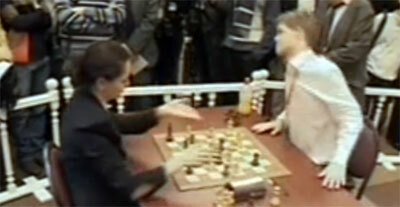 The reaction of the two greats to losing was a study in contrasts, with the World Champion resigning amicably and shaking hands (despite having a significant time advantage that might have caused Kosteniuk some trouble, though she was easily winning) and predicted future champ Carlsen simply jumping up from the table and stalking off to sip his orange juice. He knew he had let a strong attacking position slip in time pressure, but his behavior was hardly gallant. You can see video of the Anand - Kosteniuk game online at YouTube. If I am able, I will try to post some games with analysis. I was especially interested in Kosteniuk's win over Carlsen and in Aronian's handling of the black side of the Spanish in several games.